I won’t say I’ve taken a break from Super Smash Bros (one does not simply stop playing Smash) but when not playing that, I’ve been playing some Donkey Kong Country Returns for the Wii. My history with this game is a bit strange. I had rented it from Gamefly shortly after it came out (back when I had Gamefly) and played it Co-op with my little brother. I had expected it to provide a similar experience to playing co-op in New Super Mario Bros., that is, a frustrating experience where you spend more time bumping into your partner than getting through the level. But by that same token, it would also provide plenty of laughs. I was wrong. Firstly, in Donkey Kong Country Returns, the two characters you can choose are Donkey Kong and Diddy. Diddy is the superior choice, because he has a jetpack that he can use to hover in place. Since my little brother is awful at platformers, I let him have Diddy and decided to treat the game as playing in hard mode. But it’s more like “Very hard” mode. 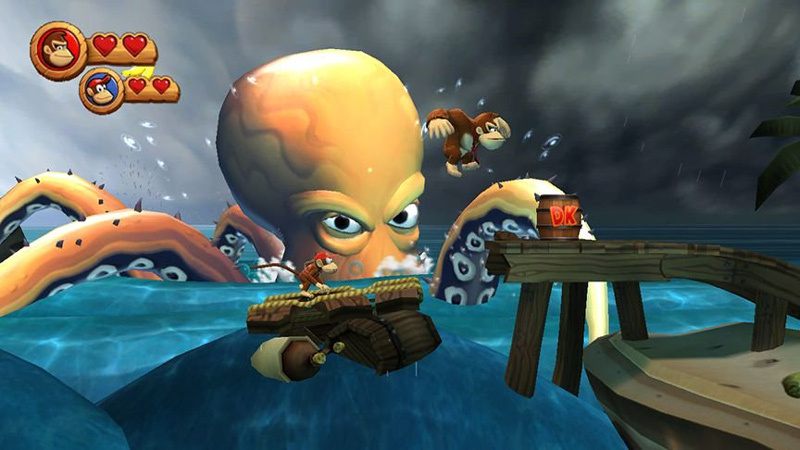 See, Donkey Kong Country Returns, in its latter levels, was just not designed for co-op play. You don’t trip over each over so much as one person makes a jump which topples the platformer they stood on. Then the Kong behind it falls to their death. Then, since my brother was horrible, he’d die shortly after, and we would get nowhere. Thus, Donkey Kong Country Returns became branded in my house as an evil game, full of devious traps and tricky platforming segments. We got to world 5 or 6, and stopped playing the game. I hadn’t picked it up until now. Which is shame, because it’s really cute to see DK and Diddy hopping around together. I started a fresh game, selected single-player, and dove in. I’m glad I did. Like I said above, Donkey Kong Country Returns is not designed to be a co-op game. It’s meant to be a single-player experience, and that’s where the game really shines. Platforming segments that drove me bonkers when in co-op now become pleasurable, if occasionally controller-smashing-worthy tests of skill. I’m really loving this game! Back up a bit. 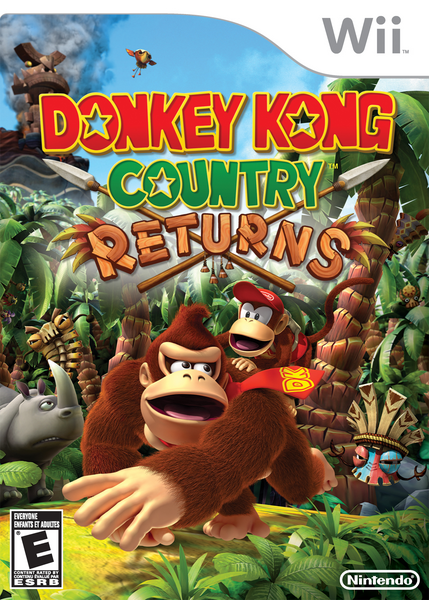 Donkey Kong Country Returns is a game meant to harken back to the days of classic Donkey Kong Country. I admit with reluctance that I have never played said past DKC games, so I cannot compare this one to those. But it’s a 2D platformer where you control Donkey Kong as he runs to the right and collects bananas. The story, what incredibly little there is, is that there’s these evil mask things with hypnosis powers. They steal Donkey Kong’s banana horde using the hypnotized animals and awaken a volcano or something. However, they can’t hypnotize Donkey Kong, either because he’s too smart or too stupid (BAH-NAN-NAHS). So, you take control of Donkey Kong and Diddy, as they get their bananas back. That’s it, and that’s all there needs to be. This game oozes personality, and it doesn’t need any dialog to do it. Donkey Kong and Diddy Kong don’t talk, instead relying on grunts (and in Diddy’s case, squeaks) to communicate. Everything else is through their animations. A lot of detail went into these, whether it’s the way Donkey Kong bangs his chest when the level begins (which Diddy adorably imitates) or the way he looks at what he collected when he completes a bonus room. It feels very much like a well-made cartoon. Nothing gets you pumped up like banging on your chest. It helps that the graphics on this game are great. The cartoon effect is used wonderfully here, creating a world that is cartoony but believable in the way that you believe an animated movie. Hold this game up to things created on the PS4 or Xbone, and I really believe this game holds up. It makes me excited to see Tropical Freeze. Playing the game is great, but I feel like it could be better. The actual platforming is quite good, with responsive and (mostly) tight controls. You control Donkey Kong as he tries to find the barrel at the end of the level, and collect things like KONG letters and puzzle pieces as you go. You can find Diddy in barrels in the level, and in single-player, he rides on DK’s back, which gets you access to his jetpack. Where the controls aren’t the best is in their insistence on using motion. You shake the WiiMote to have DK pound the ground. Fine. But you can also shake the WiiMote while crouching to have him blow things like Flowers and Candles (Banana breath, durr-hurr-hurr). And, you can shake the WiiMote while moving left or right to roll, which gives you a speed boost and is imperative to getting some tough-to-reach collectibles. For the most part, this works if it’s not very intuitive. But every so often, I’ll be trying to pound the ground and I’ll end up rolling, sometimes right off the edge. These moments are few and far between, but the controls could be tightened. I’ve heard this is addressed in Tropical Freeze, and I look forward to seeing how that’s handled.